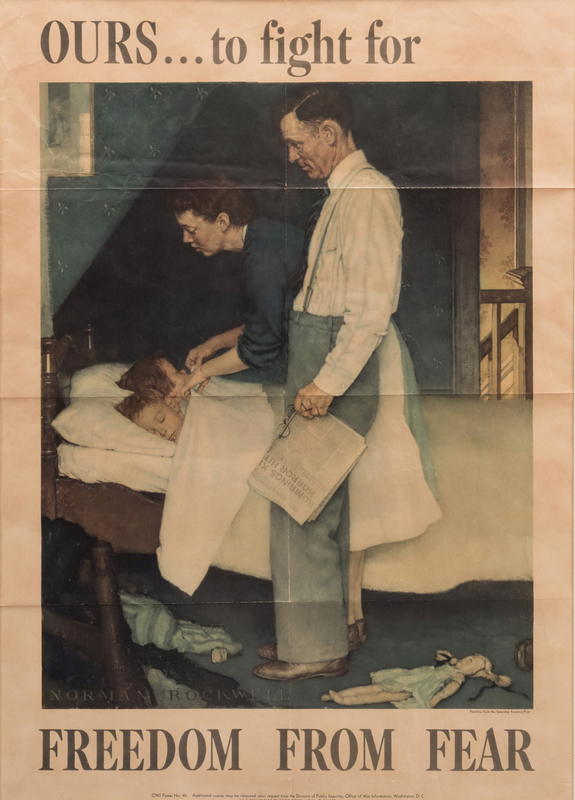 Pre War and WWII era ephemera including Norman Rockwell Poster and propaganda publications, 28 items total. 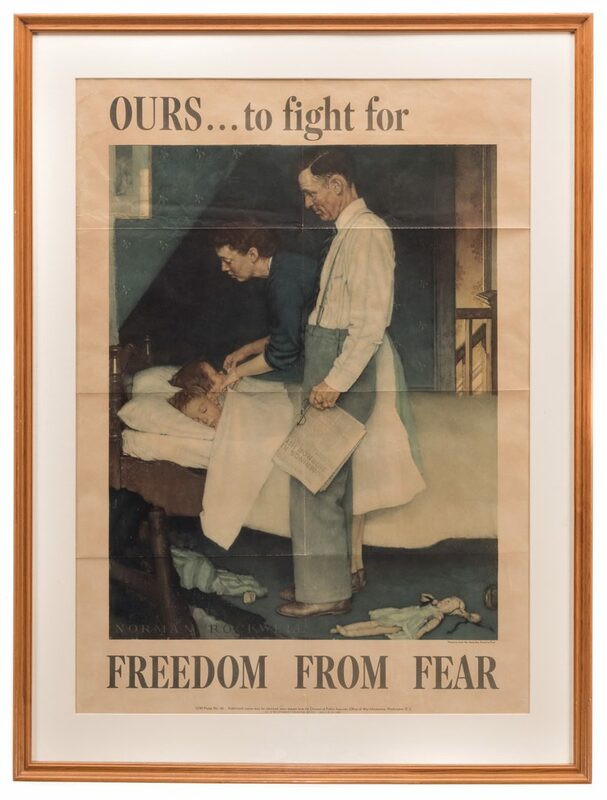 1st Item: Norman Percevel Rockwell (New York/Massachusetts, 1894-1978) poster titled OURS…to fight for freedom from fear, OWI poster No. 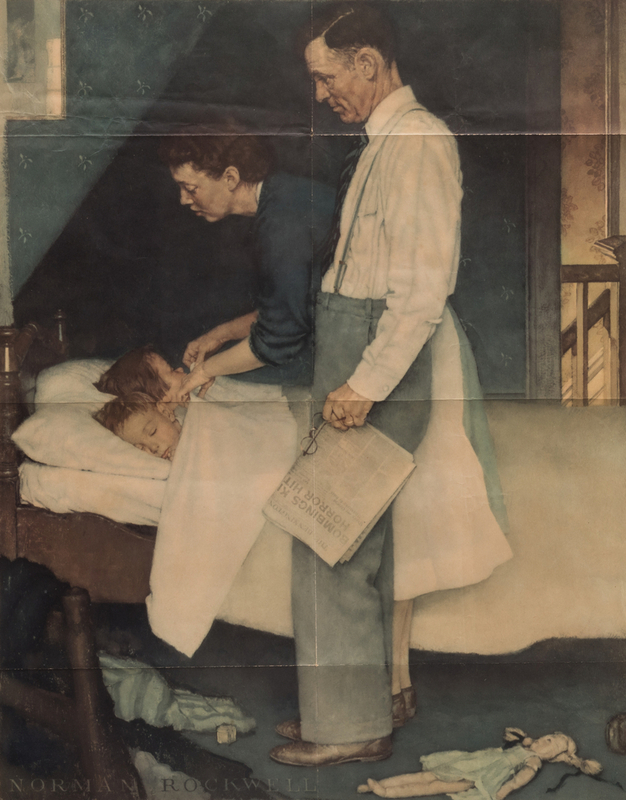 46, U.S. Government Printing Office, after the painting from the "Four Freedoms" series that appeared in "The Saturday Evening Post", 1943. 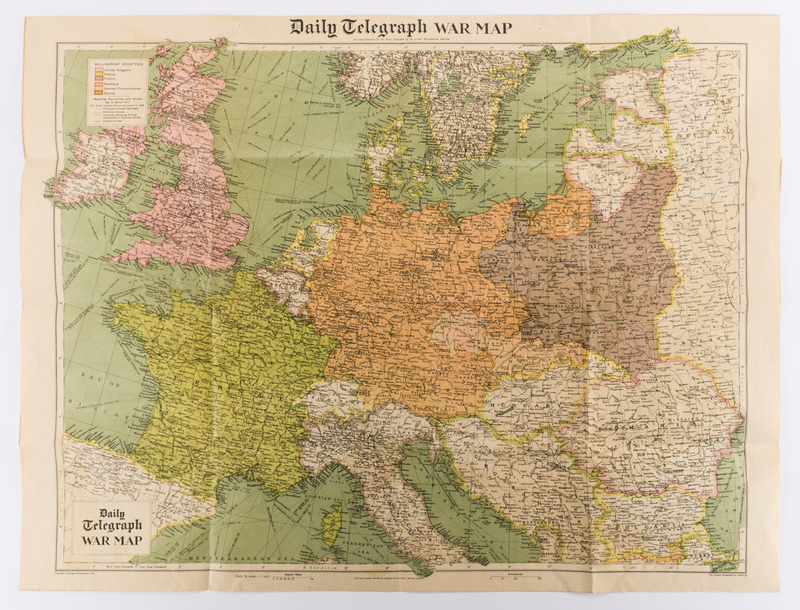 Image – 27" H x19 1/2" W. Sight – 31 1/2" H x 23 1/4" W. Framed – 33" H x 24 3/4" W. 2nd item: Daily Telegraph War Map, specially prepared by the London Geographical Institute, printed by George Philip and Son, Ltd., London, 1939. Map depicts the Western Front during WWII, with a legend listing the "Belligerent Countries" and the "Neutral Countries", top left of map. Folded – 10 1/8" H x 7 3/4" W. Unfolded – 30 1/4" H x 39 3/4" W. 3rd-6th items: Four (4) German magazines, including two (2) issues of "Wehrfront", one dated December 15, 1934, one dated January 15, 1935, one (1) issue of "Wehrarbeit" dated December 1937, and one (1) issue of "Neue JZ", dated October 10, 1939. 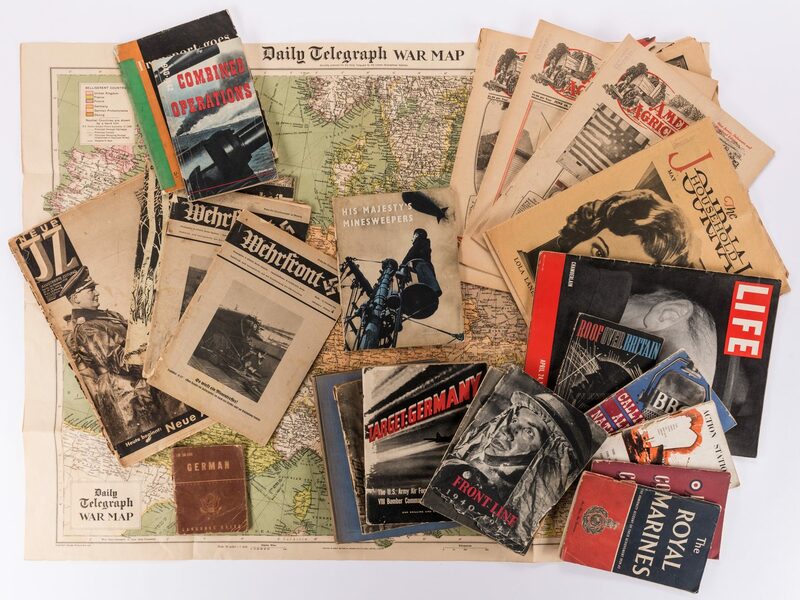 Ranging in size from 11 3/4" H x 8" W to 15" H x 11" W. 7th-18th items: Twelve (12) WWII era pamphlets/books, including nine (9) published by His Majesty's Stationary Office (HSMO), London, circa 1942-1945. Titles include "Bomber's Moon" by Negley Farson, 1941; "Action Stations! An Account of H.M.S. Dorsetshire and Her Earlier Namesakes" compiled and edited by John Creasey, HSMO, 1942; "Bomber Command Continues: The Air Ministry Account of the Rising Offensive Against Germany July 1941-June 1942", HSMO, 1942; "Transport Goes to War: The Official Story of British Transport, 1939-1942", HSMO, 1942; "Calling All Nations" by T. O. Beachcroft, circa 1942; "Combined Operations 1940-1942", HSMO, 1943; "His Majesty's Minesweepers", HSMO, 1943; two (2) copies of "The Eighth Army September 1941 to January 1943", HSMO, 1944; "The Royal Marines: The Admiralty Account of their Achievement 1939-1943", HSMO, 1944; "Target: Germany The U.S. Army Air Forces' Official Story of the VIII Bomber Command's First Year Over Europe" British Edition, HSMO, 1944; "Roof Over Britain: The Official Story of Britain's Anti-Aircraft Defences 1939-1942", HSMO, 1945. 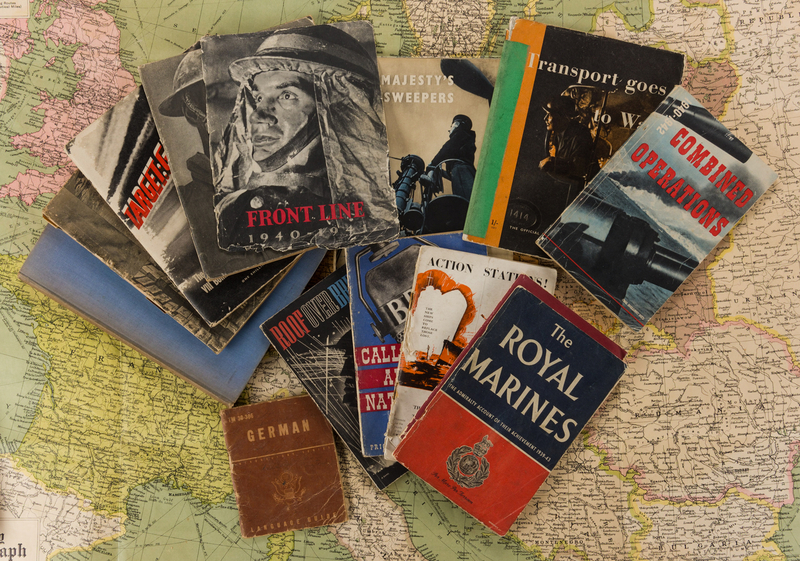 Also includes the front cover for "Frontline 1940-1941" HSMO, 1942. 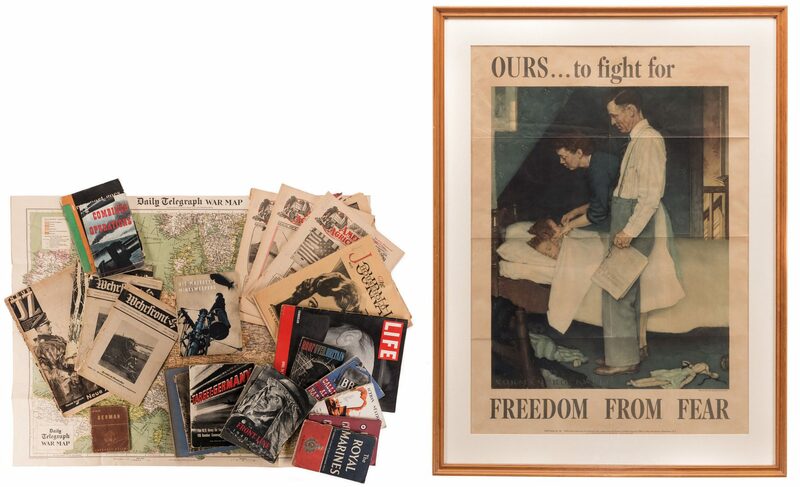 Ranging in size from 8 1/8" H x 5 3/8" W x 3/8" D to 10" H x 7 5/8" W x 5/8" D. 19th item: One (1) issue of "LIFE" magazine, featuring Neville Chamberlain on the cover, dated April 24, 1939. 14" H x 10 1/2" W x 3/8" D. 20th item: "German: A Guide to the Spoken Language" printed by the War Department, Washington, D.C., 1943. 5 1/4" H x 4 1/4" W. 21st-28th items: Eight (8) pre war American magazines, including The Household Journal. One (1) issues of "The Household Journal" magazine, dated May 1930. Five (5) issues of "American Agriculturalist" magazine, one (1) dated June 21, 1930, one (1) dated June 28, 1930, one (1) dated July 5, 1930, one (1) dated July 19, 1930, and one (1) dated August 16, 1930. Magazines approx. 14 1/2" H x 10 3/4" W. Two (2) issues of "The Southern Planter" magazine, one (1) dated December 1938, and one (1) dated January 1939. CONDITION: Overall good condition. 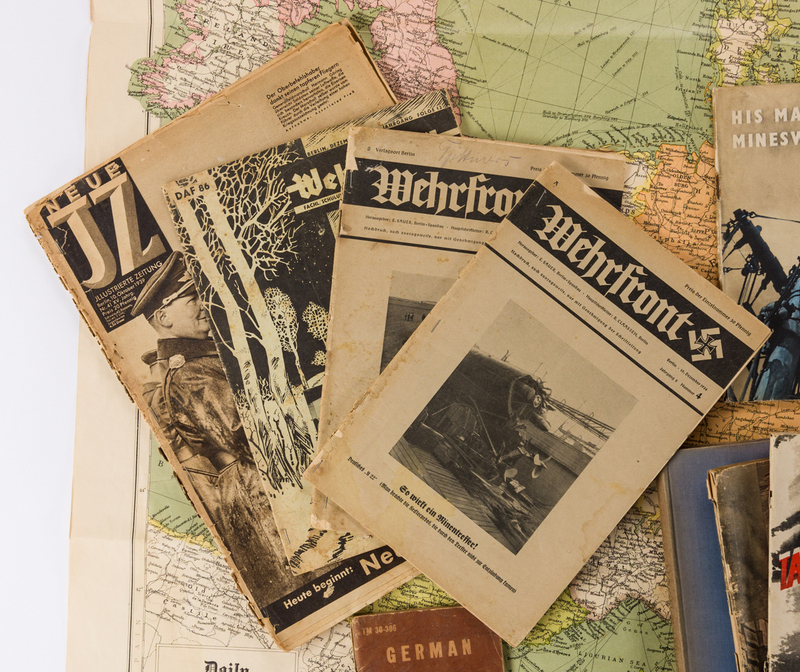 Paper items exhibit foxing, toning, tears, repairs, to be expected from age. 1st item: Overall toning, surface of poster. One vertical, three horizontal fold lines with numerous creases. Not examined outside of frame. 2nd item: Areas of dampstaining, top right and lower left of map. Dampstaining, foxing spots, visible en verso.